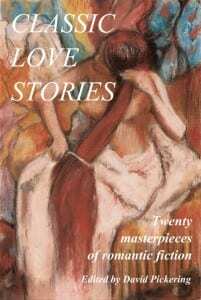 This carefully selected collection comprises twenty classic short stories on the themes of love and romance. Written by such masters of the form as Thomas Hardy, O. Henry, Anton Chekhov, F. Scott Fitzgerald and Oscar Wilde, these tales have enchanted, engaged and enthralled generations of readers and maintain a seductive and irresistible hold on the romantic imagination today. Each unforgettable story comes complete with an informative and illuminating biography of the author. Compiling such anthologies requires a lot of reading and research – time consuming, but never a chore! David Pickering is a prolific author of both fiction and non-fiction and has written books for leading publishers on both sides of the Atlantic. Other titles include the anthology ‘Classic Short Stories’, the novel ‘And Stones Shall Dance’ and the short story collection ‘Things Lost’. Readers of romance are sometimes poorly served by what’s available, so this books aims to reward readers with some of the most original and most cleverly written classics of the genre.